March 19, 2015 By This post may contain affiliate links. 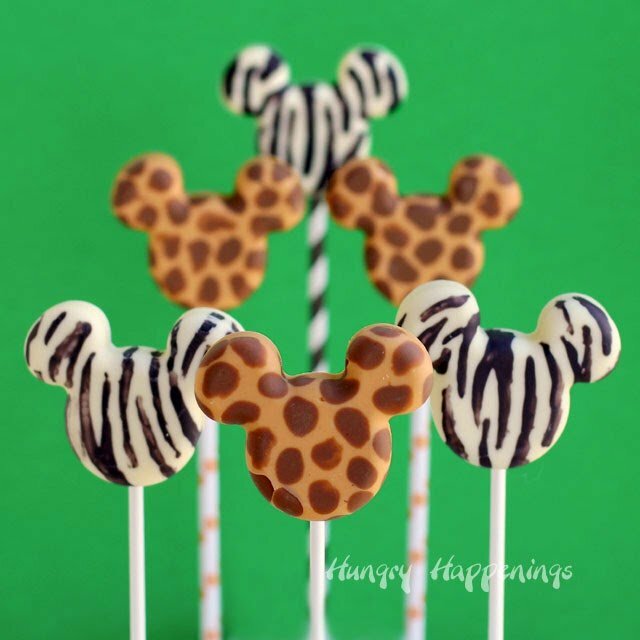 Embrace the wild and create a treat worth roaring over with these Animal Print Mickey Mouse Lollipops. 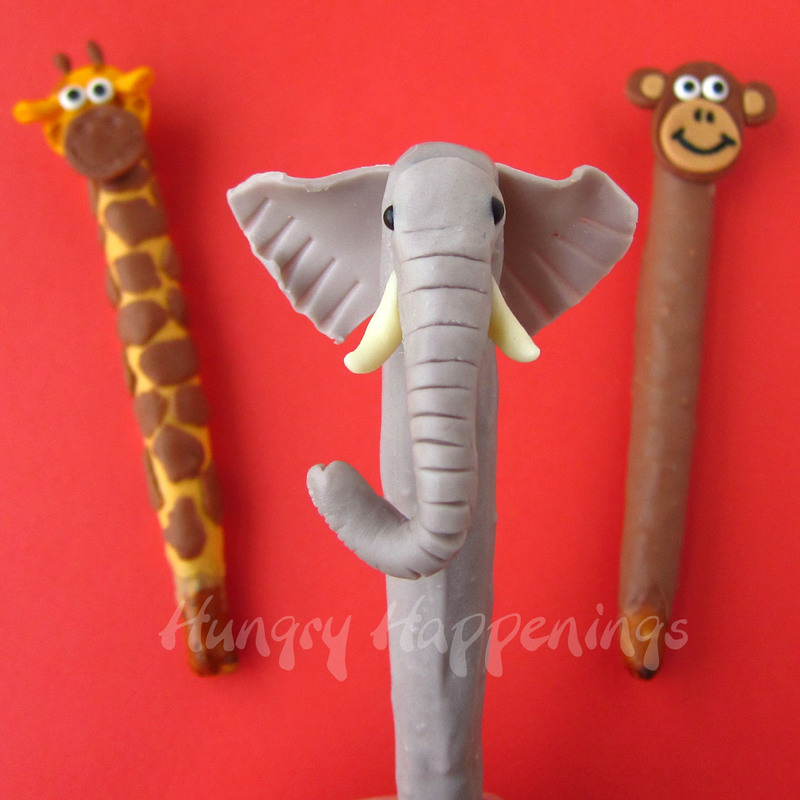 These fun desserts are perfect for any animal themed party! 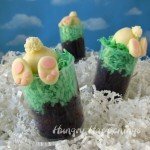 Although our recent trip to Disney was not all sunshine and roses, I did manage to have a pretty good time and have been anxiously awaiting the passing of my cold so that I could have enough energy to get into the kitchen and create a fun Disney treat to share with you along with musings of our trip. The main reason we headed to Orlanda was so that I could attend the Food Blog Forum which was by far the best food blogging conference I have attended thanks to the generous folks at Walt Disney World Resort and our conference hosts, Jaden and Scott from Steamy Kitchen and Todd & Diane from White on Rice Couple. The speakers and all the activities at the conference were fantastic and getting to spend time with my blogging buddies, Kim, The Partiologist and Jill, from Kitchen Fun with my 3 Sons really made the event special. Because the conference happened to fall on my 50th birthday, my husband, Jim, and I decided to extend our trip so we’d have 9 days in the parks. Sadly, he was sick for 6 of those days. Ordinarily that would have ruined my vacation, but fortunately for me, Kim and her daughters also extended their trip so I got to spend time with them while Jim was in bed. My niece and her fiance also joined us for part of the trip and it was really wonderful getting to hang out with them too. 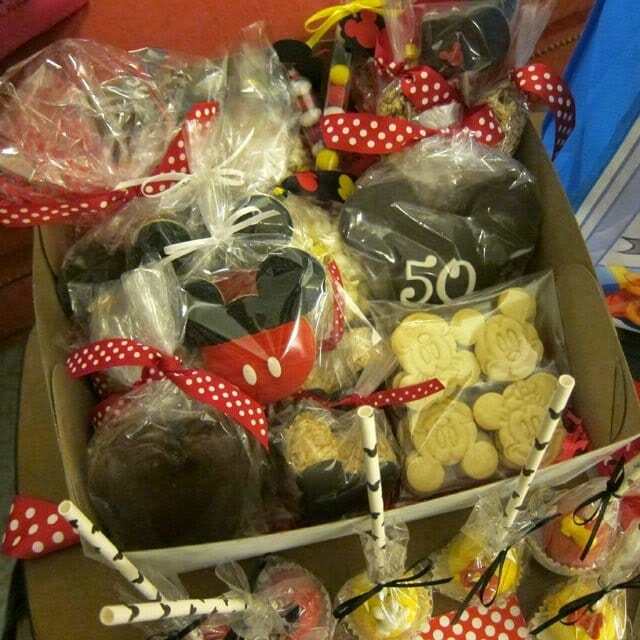 Kim made sure my birthday was extra special by surprising me with two boxes filled with amazing hand made Disney themed treats.Not only did all the cookies, brownies, cake pops, chocolates, and other treats taste incredible, but they looked so festive too. I was blown away by her gift and her kindness. This trip was really a culinary adventure. 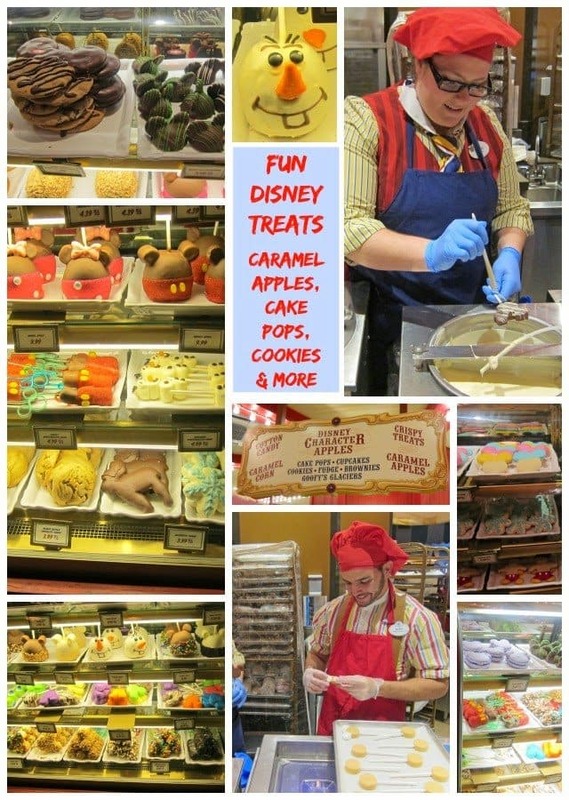 Not only did we have all those tasty treats from my birthday box to enjoy during our stay, but we dined at some of the best restaurants in the parks and beyond. During the conference, I got to experience the most amazing meal of all. Over a dozen chefs from the top restaurants on the Disney properties created their signature dishes for all the conference attendies. We dined at the California Grill on the 15th floor of the Contemporary Resort and enjoyed the spectacular view of Magic Kingdom while sampling the best that Disney has to offer. Choosing a favorite dish would be challenging, but the pork belly and chocolate dessert made by the chef’s at the California Grill were at the top of my list. We also had the rare opportunity to sample food from four Orlando area James Beard Award winning chefs along with proprietors of restaurants and bakeries at the East End Market. I ate and ate and ate. 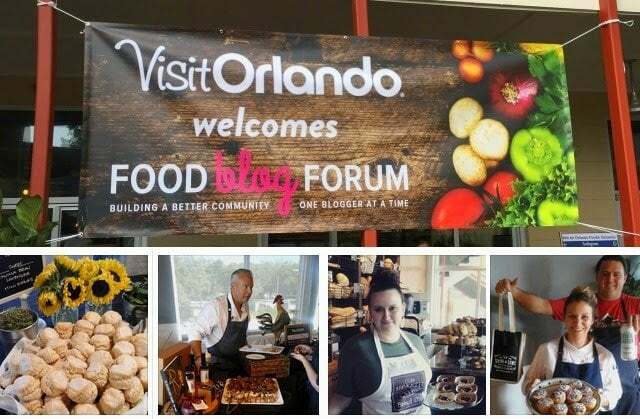 I was so happily full when the event that was sponsored by Visit Orlando was over. I was even interviewed by the local news during the event. If you want to check that out, use this link to connect to the Fox 35 website. During the conference we enjoyed the posh accommodations at the Grand Floridian, but during the remainder of our trip we stayed at my favorite resort, the Animal Kingdom Lodge.Being I had lots of down time during our trip, I took advantage of a few of the complimentary culinary programs offered at the lodge including a tour of two of their restaurants, starting in Boma, Flavors of Africa. The tour was conducted by a friendly African native who not only shared significant stories about the decor in the restaurant but also fun tidbits about her life and culture. 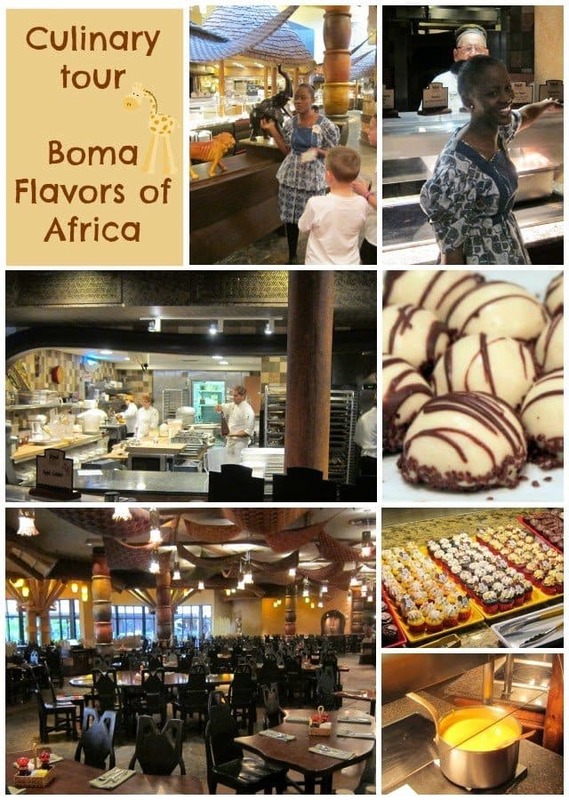 The attendies were able to watch the chefs prepare dinner and got to sample a bowl of freshly made carrot ginger soup and one of Boma’s famous Zebra Domes. I totally understand their fame, they are incredible. 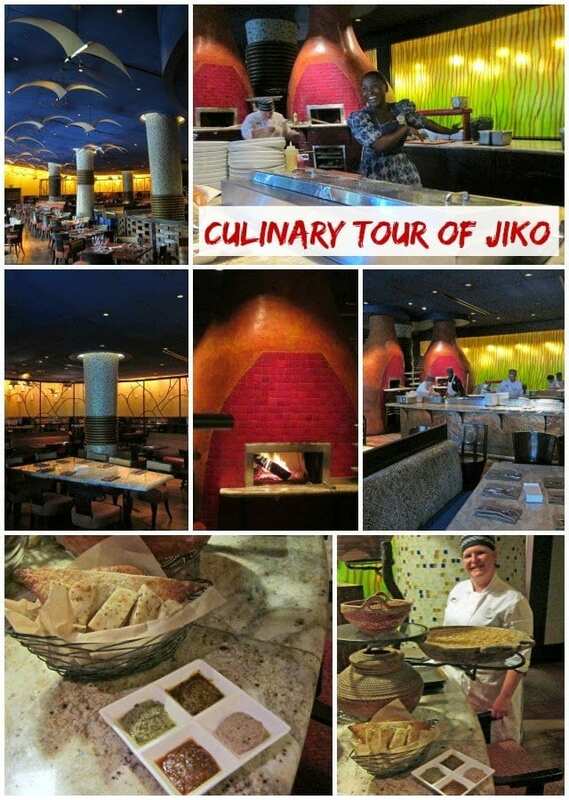 After we finished our sweet treat, we headed next door to the stunningly decorated Jiko – The Cooking Place and enjoyed samples of their fresh baked Poppy Seed Lavosh, Khobz, and Naan breads along with Bhuna Masala, Sagh Dahl, Moroccan Chermoula, and Kalamata Hummus dips. 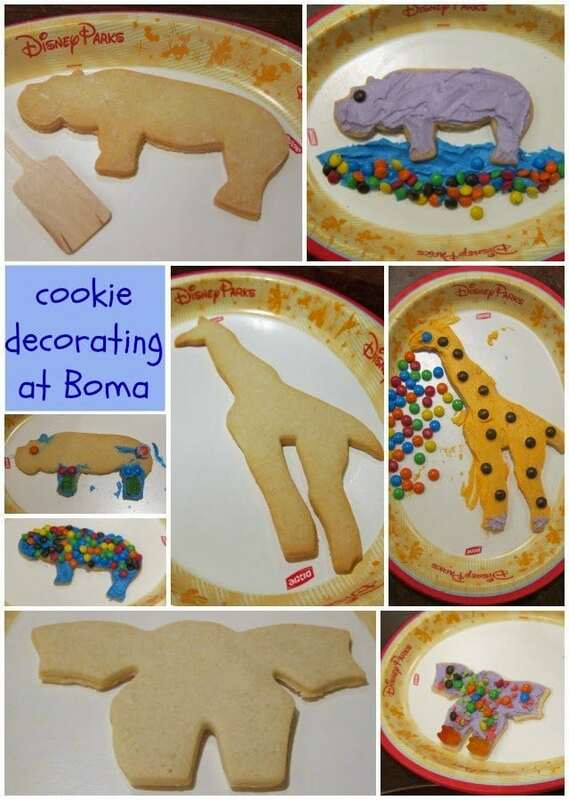 One afternoon I even joined a group of kids and adults in Boma for a cookie decorating activity. We all were given freshly baked animal shaped cookies and the table was set with a few colors of frosting, mini M&M’s, Mickey Mouse sprinkles, and gummy bears. Everyone had fun making their treats. Can you guess which cookie I decorated? 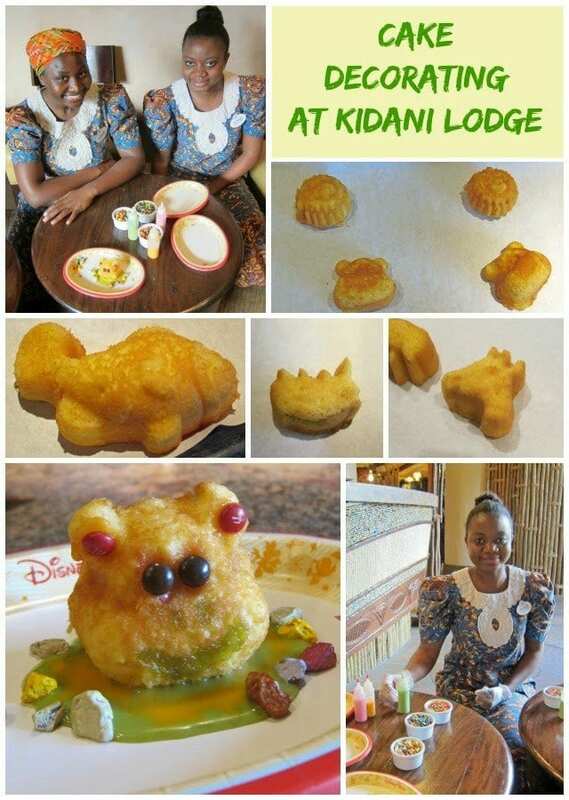 I also stopped by Sanaa at the AKL Kidani Village for a cake decorating class. I arrive pretty early and had a chance to chat with Donsie from Namibia and Tafadzwa from Zimbabwe. They were so sweet. Once again we were given frosting and candies but this time we had small animal shaped cakes to decorate. 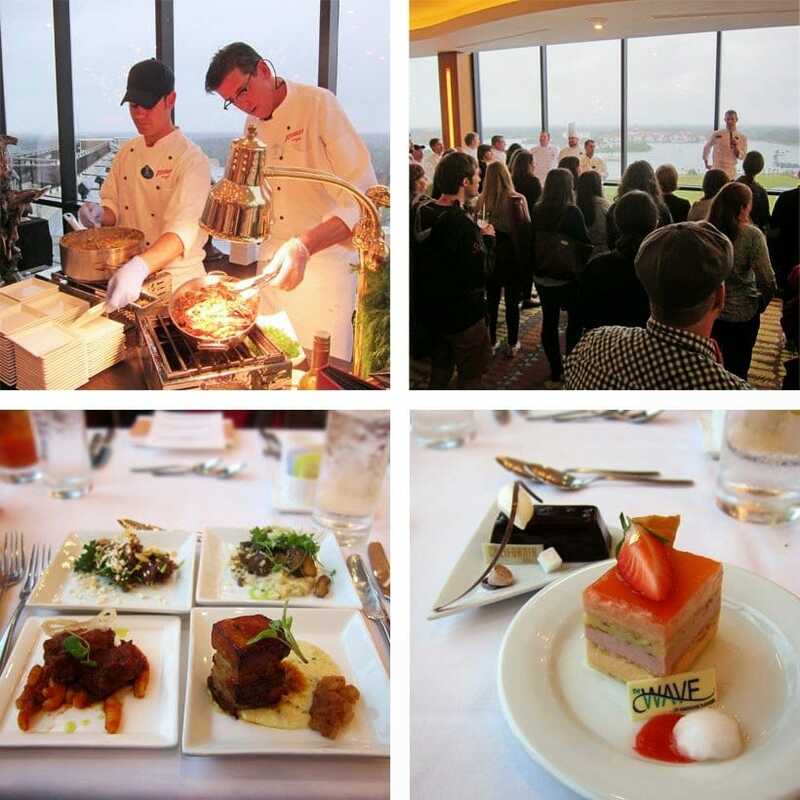 Being able to attend these three culinary experiences not only gave me something to do to stay occupied while Jim was resting, but gave me a chance to meet some really amazing people. The precious time my husband and I spent in the parks was filled with rides, restaurants and shows. I hadn’t even been inside a single shop until the last day of our trip. I was hanging with Kim and her girls and we got out of the cold and spent some time watching Disney cast members create cake pops and other fun edible crafts. 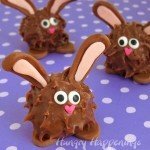 I was quite impressed with all the treats on display and was so inspired to make some of my own once I got home. 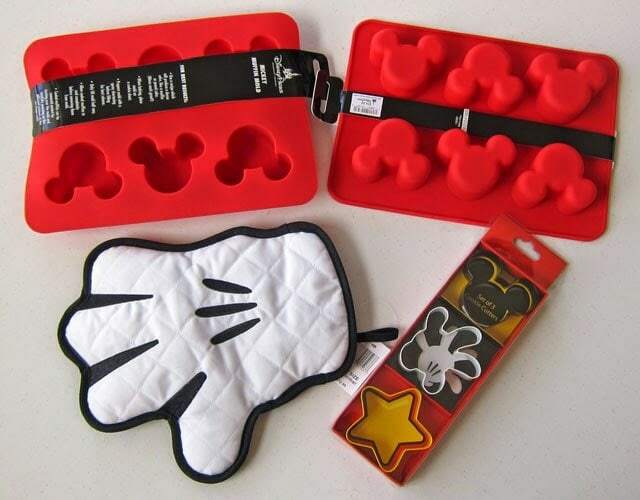 I couldn’t resist buying a few new kitchen supplies including some silicone molds, an oven mitt, and some cookie cutters. 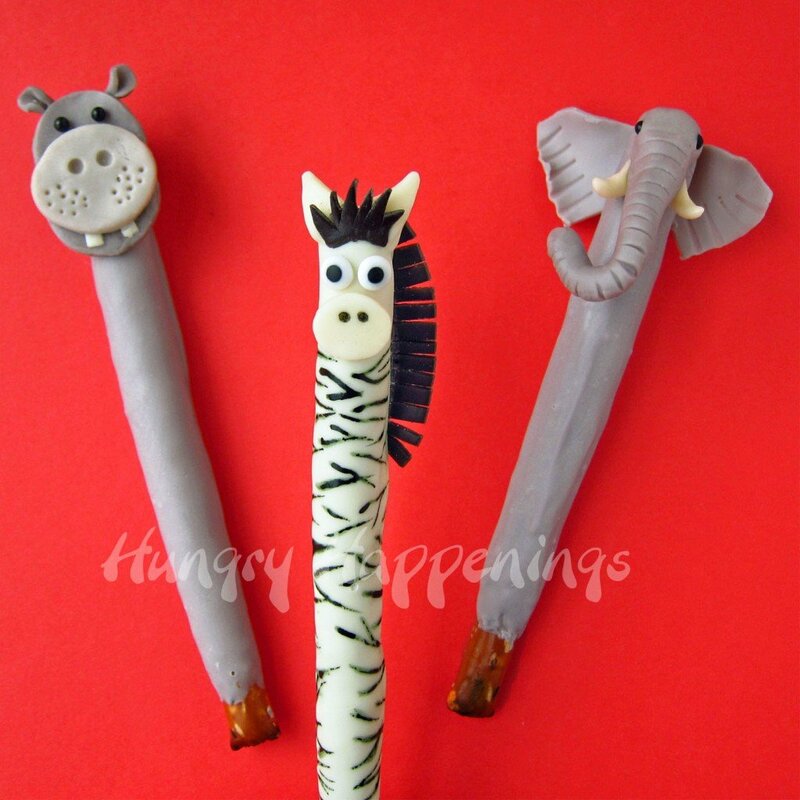 I used the silicone molds to create some lollipops inspired by my stay at the Animal Kingdom Lodge. I spent hours sitting on the balcony outside our room watching the animals roam the savana. 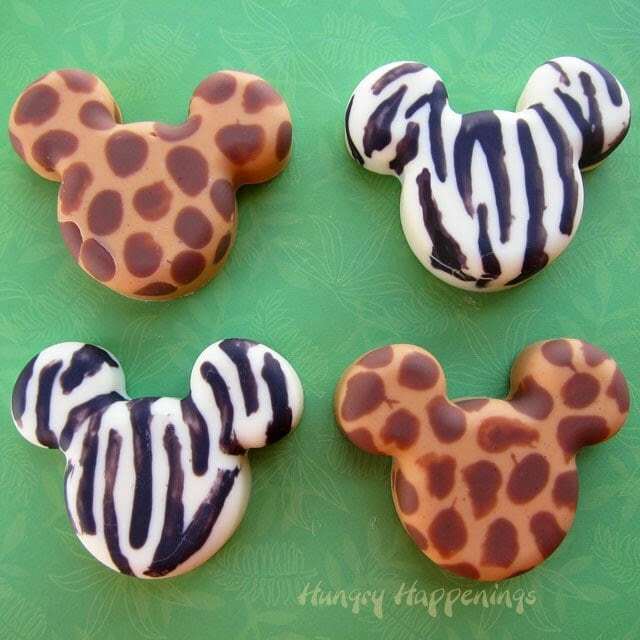 My favorite where the giraffe and zebra, so I used their prints as inspiration for my own Disney themed treats. Melt the confectionery coating wafers. I poured mine into glass jars and heated them on high in the microwave for 30 second increments, stirring after each, until melted. Then I set the jars in an electric skilled filled with water (enough water to go half way up the sides of the jars) and turned the heat on the lowest setting (warm.) This kept my candy coating melted as I worked. and black stripes for the zebra. 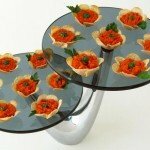 Pour melted confectionery coating into the molds creating a 3/4 inch – 1 inch thick layer. You don’t want these much thicker than that because they will be hard to bite into. 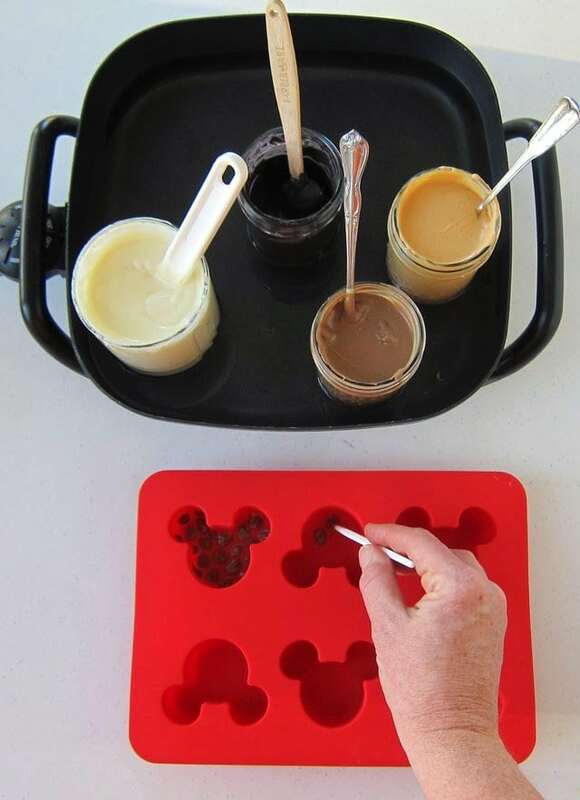 Once filled, pop the molds in the freezer for about 10 minutes until the candy coating hardens. 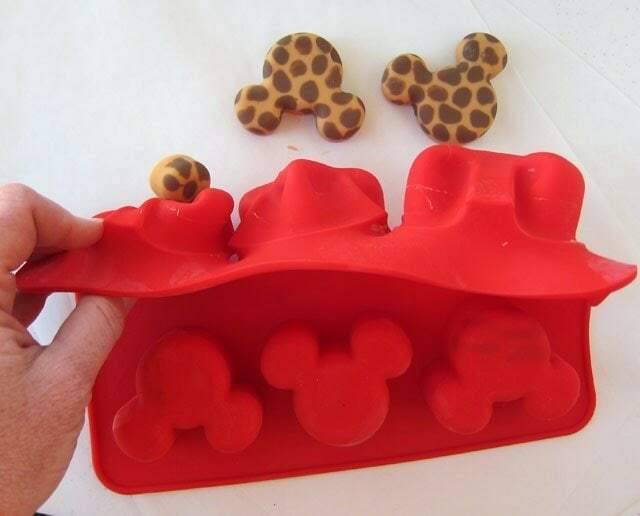 Turn the mold upside down and press down on the the back side of the mold, peeling the candy out. 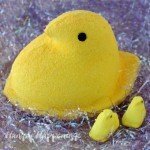 Allow the candy to sit at room temperature for at least 20 minutes. 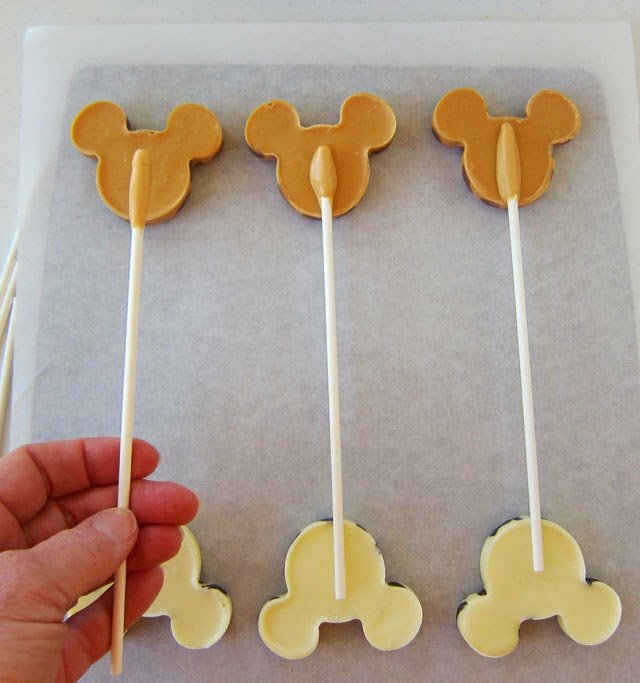 You can leave your candy Mickey’s just as they are or put them on lollipop sticks. If you want to ad sticks. 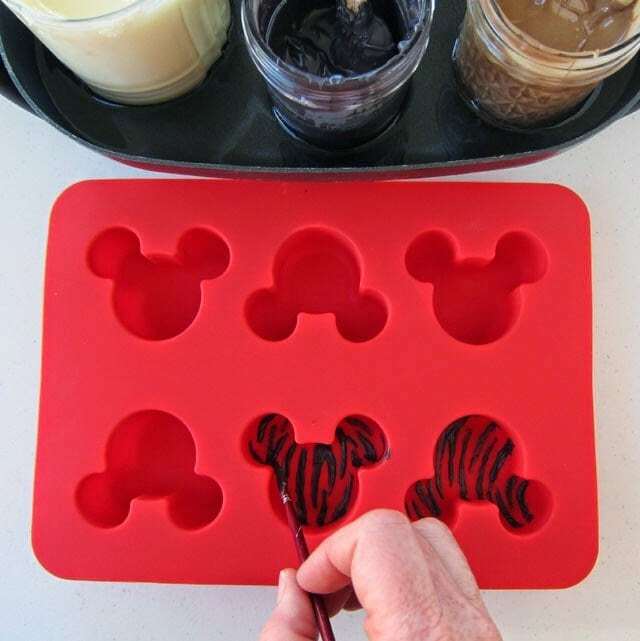 dip one end of a lollipop stick into the melted candy coating and set the wet end on the back side of a candy Mickey Mouse. To keep my lollipop sticks level, I found it best to set the dry end on top of another Mickey Mouse candy. 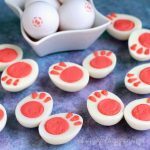 These Disney themed treats will stay fresh for at least a month. 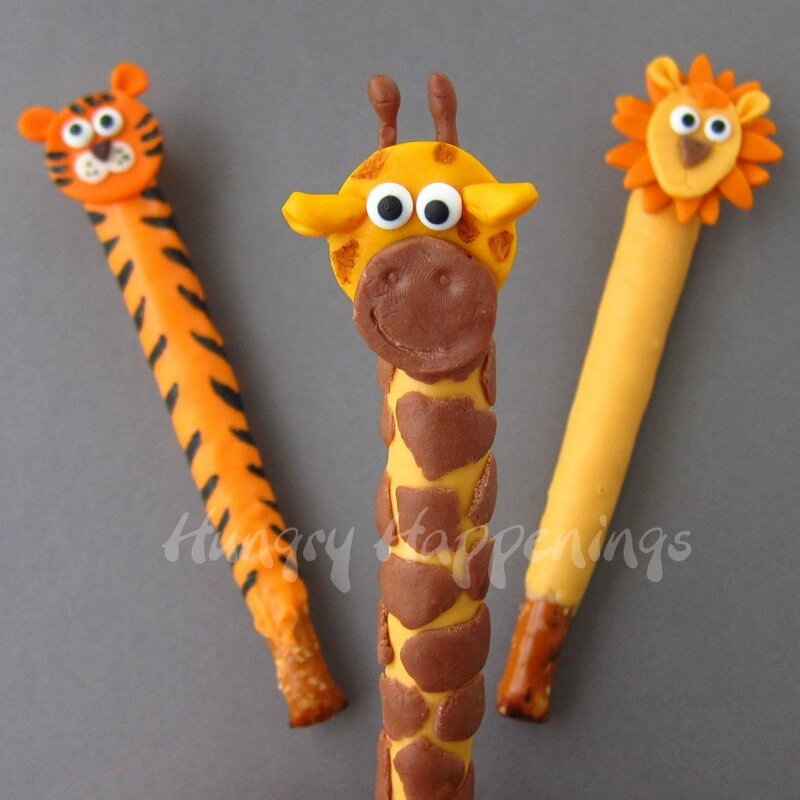 You can wrap them in clear cellophane bags and tie them with ribbons to give as treats, or just dig in and enjoy.I hope you had fun reading about my Disney trip. My husband and I have decided we need a Disney do over vacation. 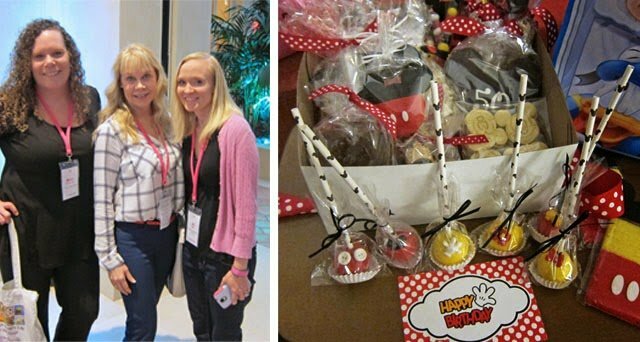 I’m not sure where the Food Blog Forum will be hosted next year, but if it’s Disney, I sure do hope to go again. 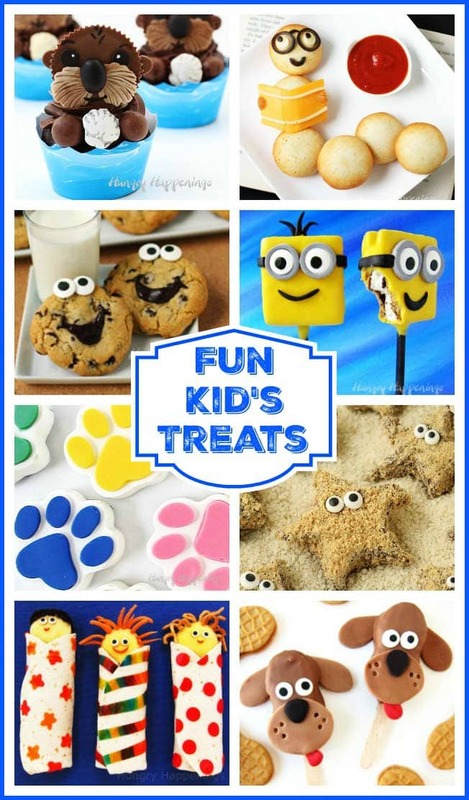 If you liked this Kid’s Recipe, then you need to check out these other fascinating recipes that your little ones will love! Your pops are adorable! What a fun trip and it was so nice to finally be able to hang out with you and Kim. Hoping to go back very soon! It was so great meeting you too. I can't wait until we meet again! Wow sounds pretty amazing! Well except for sick hubby part and so jealous you got to hang out with the best ladies! (Yourself included!!) And love those animal print Mickey ears!! It was pretty amazing getting to hang out with Kim and Jill. I sure wish you could have joined in the fun! I love DisneyWorld. It's my favorite place. I would have loved to attend this food blog conference…next year maybe. I enjoyed reading about your adventure though, it sounds like it was a good time. 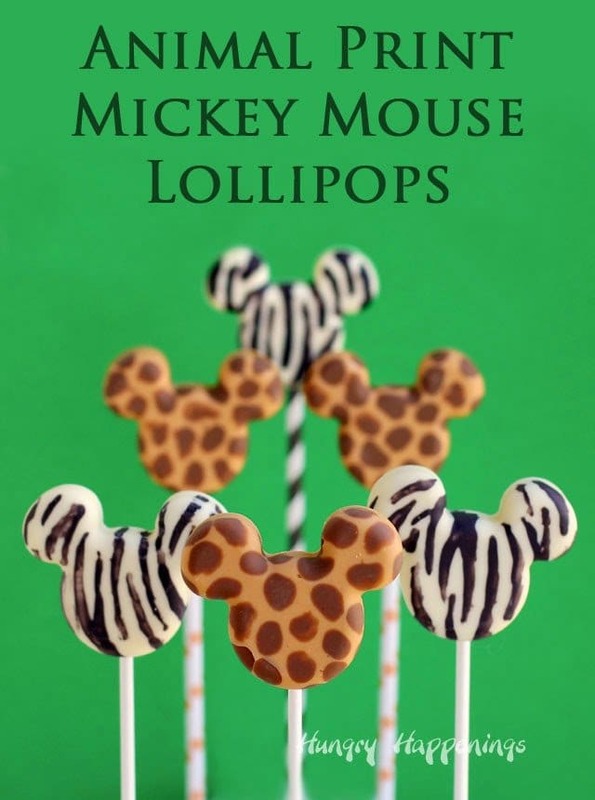 I love the Animal Print Mickey Mouse Pops too! Pinned! Disney is one of my favorite places too and we sure hope to get a do over of our vacation sometime soon so my husband can actually enjoy the parks too. 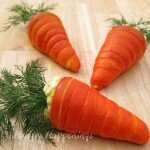 The conference is a must do for any food blogger lucky enough to get tickets. Thanks for the pin! Wow what an amazing opportunity! Your talent is waaaay beyond my skills so I'm here to admire! It sure was an amazing opportunity. 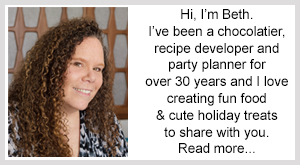 I'm happy you stop by and hope to encourage you to get into the kitchen and have some fun making crafty food. I sure did have fun with the other mouseketeers. Hanging with them was amazing and I can't wait to do it again. You picked out my cookie from the collage. It was fun to see how excited the kids were about decorating their cookies. I really enjoyed all three of the culinary activities. We stopped by the Polynesian one night but didn't get to see a room. I'd love to stay in one of their over the water bungalos. That would be pretty cool. I highly recommend the Animal Kingdom Lodge particularly if you like to go back to the room in the afternoon. The pool is nice, there are two hot tubs and so many animals to see, and they have lots of daily activities including the 3 food ones. I look forward to going back again soon! 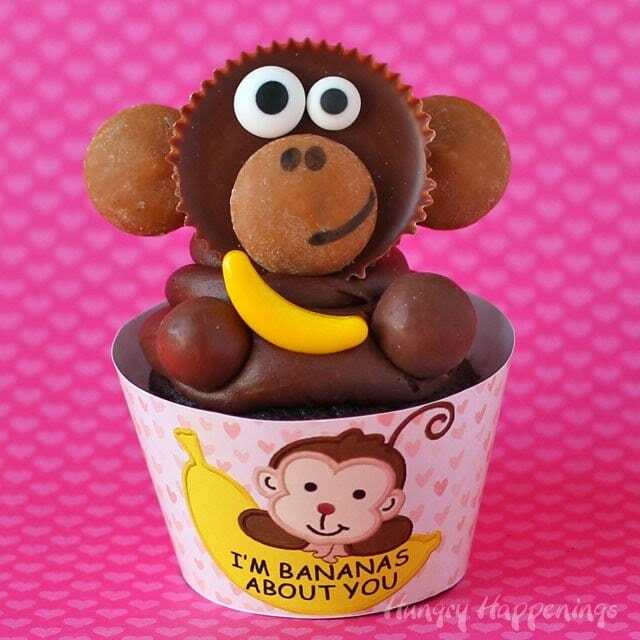 These are so cute…to cute to eat :)! Stopped by via Thrifty Thursday! These pops are adorable! Glad you had fun at FBF!